Died April 14 (or 17), 1939 at the wheel of his automobile from a heart attack. Born in Missouri in 1878, Mr. Frost was a graduate of the University of Missouri. He became a teacher. He also did some mining in the west and banking in New York. Mr. Frost talked Edward Yeomans into starting Ojai Valley School and he built the first dormitory there, still known as Frost Hall. He was also instrumental in organizing the Frost-Coolidge Music Festival in 1925. Funeral Services for Mr. 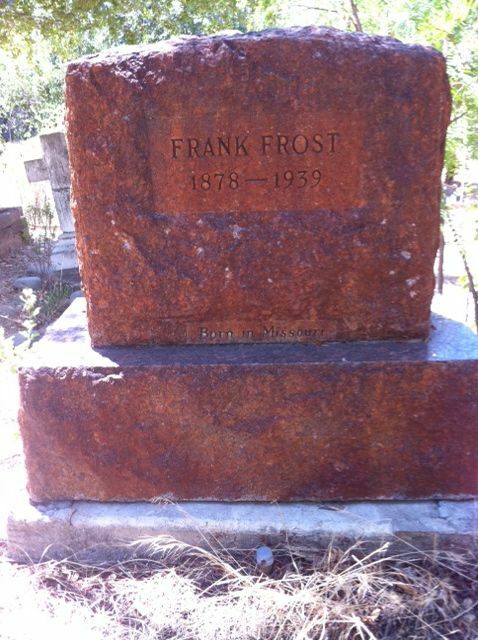 Frost were in San Francisco and he was buried in the Nordhoff Cemetery. Mr. Frost left five children, Morris, Emily, Frank Jr., Robert, and Anne. Mr. Frost was so well known in fine music circles that his obituary was reported in newspapers in San Francisco, Los Angeles, New York, Washington DC as well as Palo Alto and Ojai. Mr. Frost was reportedly buried in his favorite red plaid shirt and brown suit which was handwoven from Norwegian homespun yarn. One of his sons said at the time of his burial that the Nordhoff Cemetery was just the sort of place Frank Frost would have loved. And that he would have been pleased by the fact that three Scotchmen are buried near him. The above is an excerpt from Nordhoff Cemetery, Book Two, by Patricia Fry with Dennis Mullican.